LibDems always suffer from squeezes, but they've never been knocked out despite the rush to paint all issues as either-or questions. So we shouldn't count them out just yet, despite current opinion polls putting them at the lowest for a generation. There is a simple reason the LibDems are consistently squeezed before mounting a fightback – false arguments are habitually employed against them. This may be done sincerely or as deliberate politically-motivated scare tactics, but the truth has a way of fighting back. Labour is currently scaring people that the cuts are a callous ideological-based attempt to hit the poor, and this clearly has some traction, but while some thatcherites may wish this the doubling of the long-term growth rates in public spending since 2000 from 3% to 6% simply can’t be sustained – especially during an economic downturn. In fact this is one of the major contributory factors in spurring the downturn, and until spending is put right the national economy risks spiralling out of control. The thatcherites want to see the trend fall below inflation. 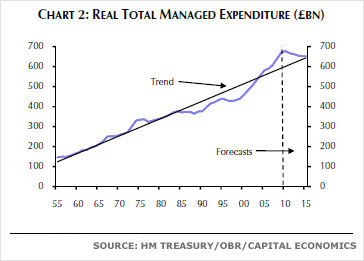 LibDems are arguing that current spending growth should return to trend. Cameron has overseen the formation of a coalition between these two different arguments and this enabled him to gain power – it is interesting that he has diplomatically avoided a full declaration of his intentions, which is why he is regarded with suspicion by both thatcherites and LibDems (and outright contempt by left-wingers), but that is how he was successful in becoming PM – he holds the key to maintaining the tenuous balance of power. Which is also why the left is remorseless in attacking Clegg’s use of ‘fairness’. According to forecasts the cuts will see the country return to trend in 4-5 years, or about the time the coalition has stated they will call the next general election. If LibDems didn’t support the proposed level of cuts the point at which their arguments diverge from the thatcherites would occur after the next election and this would necessitate an electoral pact – which is against LibDem interests and runs against all instincts of activists in both LibDem and Conservative parties. So Labour’s hopes of returning to government within the next decade depend upon either an early election caused by LibDem withdrawl from the coalition, or upon a lower rate of cuts to enable them to paint LibDems as tories in disguise. Labour is making a big political gamble, but then so too is the coalition gambling that the private sector is able and willing to grow at the same rate as the state will contract - and 120,000 jobs per year would be more possible if it weren't being done at the same time as raising the retirement age.